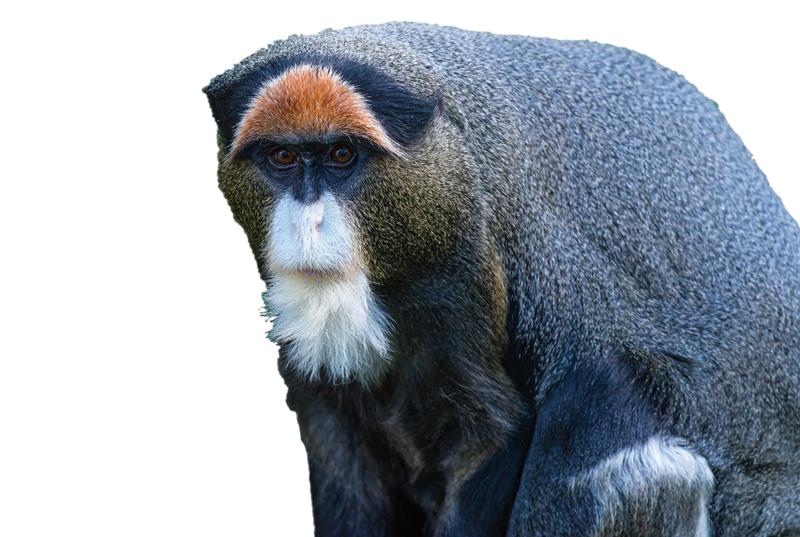 De Brazza’s are a member of the Guenon monkey family. Guenons are medium sized forest dwellers. They are slender with a long tail and distinctive short face. Guenons are some of the most striking looking monkeys. They often have peculiar features such as nose spots, brow bands, beards and moustaches. Despite being widespread, De Brazza’s monkey is generally shy and inconspicuous, only rarely announcing its presence with deep, booming group calls. This species is mostly arboreal, but unlike other guenons, which usually stay in the tree canopy, it is often found moving through the forest understory or along the ground. The diet consists mainly of fruits and seeds, although leaves, mushrooms and small reptiles and insects may also be consumed. As foraging usually takes place in exposed areas, food is stored in cheek pouches, and only eaten when the monkeys return to a safe location. The National Zoo & Aquarium is home to one De Brazza’s monkey; Pjay.